Drove from Brandon to Regina, a 4 hour drive. 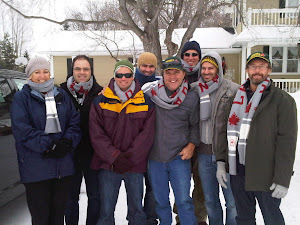 At Regina we met up with current Canadian Nuffield Scholar Kelvin Meadows and his wife Shelley. They coached us in a game of curling. We went to a large indoor ice centre for a game. Curling is a favourite Canadian pastime enjoyed by young and old alike. It involves a player sliding a heavy rock with a handle attached, along the ice some 50 metres or so towards a bullseye. 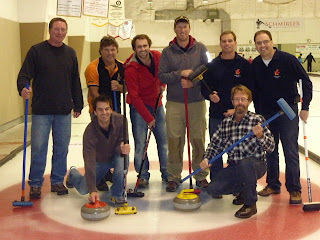 His/her teammates furiously sweep the ice with brooms immediately ahead of the rock to encourage it towards the bullseye. I was happy not to be the only scholar to spend time horizontal on the ice! Its a great laugh! Afterwards we travelled to the town of Moose Jaw where we are to be based for the next 2 nights. Moose Jaw is a medium sized town set up about 100 years ago to service the railway and surrounding farming district. It has an interesting history, well known for its colourful past in manufacturing and running moon-shine (sligh grog.) We went for a tour of the underground tunnel system which was used to assist the illegal activities to prosper. The tunnels were also used to house a cheap and poorly treated Chinese population which worked on the railway and laundry.